Whether you’ve cracked a tooth out on the football field or woken up in the morning with searing pain in the back of the mouth, dental emergencies can easily ruin a person’s day. At Atrium Family Dental, we want to be there for our patients and their families when they need us most. That’s why Dr. Albert, Dr. Stylski, and Dr. Snow make time for urgent, relieving care as soon as possible – no days or weeks of waiting required. Contact us today in New Lenox, IL! Serious falls and physical accidents can result in a wide range of dental injuries, from fractures to extensive tooth loss. In these scary situations, we urge patients to remain as calm as possible and pick up the phone right away. There is typically a very limited window of time to successfully replant natural teeth, so don’t wait to contact us in New Lenox. If you have fully knocked out a tooth, try to carefully place it back in its original socket and hold it there until you reach us. Otherwise, carrying it in a container of milk to keep it moist is the next best alternative. Excessive sensitivity and/or outright pain in a specific tooth is typically caused by a lack of proper brushing and flossing over time. This can lead to serious cavities and even advanced infections underneath the enamel that will need to be properly addressed if the patient hopes to keep the tooth as a safe and stable part of their natural smile. If you’re experiencing a prolonged toothache, please contact our practice for further assistance. While it is safe to take a painkiller like Aspirin to manage your symptoms before treatment, do not place it directly on the gum tissue; this could cause further damage. At Atrium Family Dental, we’re proud to feature the services of not just one, but three different dentists with extensive advanced training and a genuine commitment for providing outstanding patient care. We can personally address even extensive dental trauma with proven restorative solutions, specialty treatment options, and cosmetic makeovers for regaining your smile’s best qualities. Better yet, we schedule emergency appointments ASAP and are often even able to fit patients in for treatment on the same day as their initial call – no waiting required. Endodontic treatment, commonly referred to as root canal treatment, is a general dentistry procedure used to repair or salvage teeth that are infected, damaged, or badly decayed. 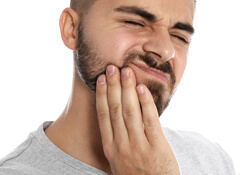 The procedure involves removing the nerve and pulp from the affected tooth, as damaged pulp can lead to bacterial infection, which causes abscesses, bone loss, swelling, discoloration, and drainage problems. 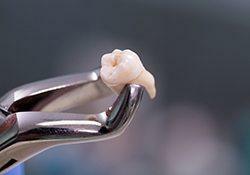 Once the tooth pulp and nerve have been removed, the inside of the tooth is cleaned and sealed to prevent further decay. Though the treated tooth will no longer be sensitive to hot and cold, as the nerve will be absent, it will still retain full functionality. If a tooth is severely damaged or abscessed, it may need to be removed entirely and replaced with a dental implant. 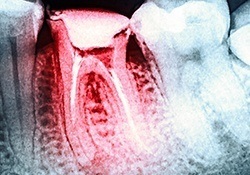 Tooth extractions are often done with local anesthetic, though in some severe cases, general anesthetic may be required. Once the affected tooth has been removed, the gum tissue will be sutured and covered with gauze to help absorb and prevent bleeding. Dr. Albert will often prescribe pain killers to make the post-operative recovery more comfortable and recommend a regimen of mild activity along with careful dieting and oral hygiene habits. Eating soft foods and gently brushing the teeth and tongue will be required until healing is complete.